A new horse registration form is to be sent into ESNZ along with payment as usual. There is no initial charge for the ID book for a NEW horse. The ESNZ Membership Services Team will issue an ID book with the name of the horse on the front of the book and keep the registration on file. The ID book is then sent out to enable the vet ID page to be completed. The registration will not be processed until the ID book is returned to be validated. Upon receiving the new ID the horse owner is to complete the horse ID page (either by a vet or they may do it themselves) and return the ID book to ESNZ to be validated. The owner will have 1 month to have the ID book completed and returned to ESNZ. At the end of the 1 month period if the ID book has not been returned, ESNZ will contact the owner and a charge may be applied for the cost of the ID. Once the ESNZ Membership Services Team receives the ID book back; they will then process the registration, validate the ID book and return it to the owner. Failure to return the ID book after one month may incur a $20 charge for the cost of the ID book. Once the ID book is issued it becomes the liability of the owner. This system will be trailed for a year; if people abuse the system then consideration may be given to a return to the current system. 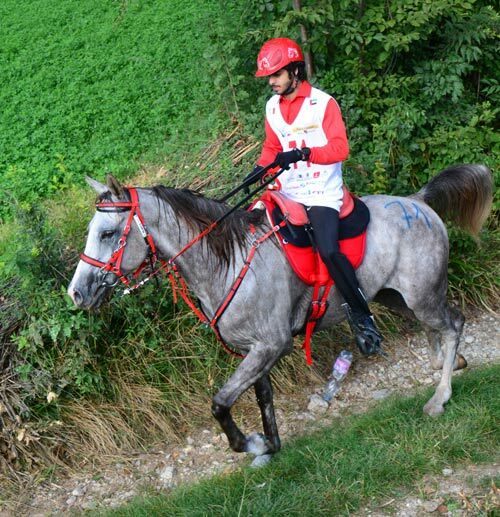 Saeed Mohammed Khalifa Al Mehairbi on Za'amah won the Shaikh Mansour bin Zayed Al Nahyan Endurance Cup 100km ride with Bahrain's Shaikh Mohammed bin Mubarak Al Khalifa on Kelallie de la Cure and Fahad Al Khatri second and third respectively at the Italian Endurance Festival 2015 in Verona, Italy on Saturday. In the Shaikha Fatima bint Mubarak Ladies Cup, the UAE won the bronze in the team competition behind France and hosts Italy. Meanwhile, Saif Ahmed Al Mazroui on Descarado won the Shaikh Mansour bin Zayed Al Nahyan Global Arabian Horse Flat Racing Festival-sponsored FEI World Championship for Young Horses. 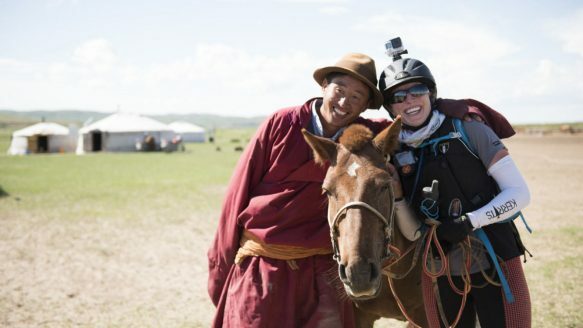 AN USK rider who competed in one of the world’s toughest horse races will be speaking about her experiences next month. Consultant gynaecologist, Charlie Fleming, competed in the Tevis Cup, in the USA, in August. The 24-hour 100-mile endurance ride through the Crystal Range of the Sierra Nevada Mountains, is the toughest and most challenging endurance ride in the world, with only around half of all entrants finishing. She became interested in endurance when she bought her first horse in 2004. She said: “I was attracted by the combination of map reading in remote areas, horse physiology and pretending to be Dr Doolittle. “Since then it’s become a passion and I’ve risen from novice, open, through to advanced and now I compete at FEI international level." The Board of directors of the 2018 World Equestrian Games announces the appointment of its new chief executive officer, Mr. Luc Fournier, taking over from Paul Côté, who has accepted a new challenge. I thought I was hallucinating when I rode past the rotting horse carcass sprawled on a dusty trail somewhere in the middle-of-nowhere-Mongolia. But the swearing behind me confirmed my fellow rider Thomas Ellingsén had seen it too. We halted our horses and stared at the cracked, drying hide receding from the animal’s skull, wondering if it was disease, predators or starvation that had ended its time on Earth. Buzzing flies provided the only white noise in the stillness as Ellingsén brought out his camera to snap a picture, a permanent reminder of the fragility of life in the wild. International horse transport has been blamed for the first outbreak of equine influenza in Malaysia in nearly 40 years. The occurrence has resulted in a disruption of events in the racing industry and a complete ban on horse movement in and out of the country, according to official reports. Horse races across the country have been cancelled since the outbreak was detected in late August. However, morning gallops were allowed to resume at affected courses last week. “Serious doubts” have been expressed about the authenticity of a trainer’s “confession” exonerating a member of the Bahraini ruling family from blame in a reserpine doping offence. The FEI Tribunal found that the endurance rider, Sheikha Najla bint Salman Al Khalifa, had not established the fundamental principle of “no fault no negligence” for the presence of the banned sedative in her ride Salahdin du Lauragais at the 120km CEI in Verona, Italy, on 26-27 July 2014. It suspended her for two years. Problematic from the start, the groups involved with bringing the 2018 Bromont WEG to fruition continue to struggle with organizing the behemoth event. At the end of August they lost their long-standing leader, Paul Côté, who had been chair of the bid committee and was subsequently named CEO, when he announced his resignation. This week, the Town of Bromont has – for the second time – refused to grant the long-term lease necessary to build the 4,500-seat indoor arena. Spain's Jaume Punti Dachs repeated his win in the 2013 European Endurance Championship by winning the 2015 FEI CEI**** 160-km European Championship held in Slovakia over the weekend of September 11-13. Riding the 14-year-old Ajayeb this year, the pair crossed the finish line in a time of 7:05.13, by just one second over the Netherlands' Marijke Visser, riding Laiza de Jalima. France's Jean Philippe France (another former European Endurance Champion) finished third aboard Secret De Mon Coeur in 7:13.31, just nipping 4th place Alex Luque Moral of Spain aboard Calandria PH by two seconds. Spain's Maria Ponton, yet another former European Champion, finished 5th riding Selif De La Nie. Best Condition went to Jean Philippe Frances and Secret de Mon Coeur. Spain won the Team Championship, in a combined time of 21:50.59. France took the silver in 22:42.28, and the Netherlands got the bronze, in 23:54.31. 37 riders out of 65 starters completed the course. Westcountry horse riders seeking a unique challenge are being offered the opportunity to take part in a new multi-day riding experience, with an exclusive pilot event later this month. The Dartmoor Derby has been created and organised by the team behind existing top adventure riding business Liberty Trails, in partnership with The Riding Club London. Covering a distance of 100km across Dartmoor in Devon, the ride is open to competent riders from around the world and will take in wide stretches of open moorland, forests, ancient stone circles and some of the Westcountry’s finest views. Abu Dhabi: The HH Shaikh Mansour Bin Zayed Al Nahyan Global Arabian Horse Flat Racing Festival will stage a series of endurance rides including the HH Shaikha Fatima Bint Mubarak Ladies Endurance CEIO Cup for teams in Verona, Italy, later this month. Details of the events, which will take place under the directives of Shaikh Mansour Bin Zayed Al Nahyan, UAE Deputy Prime Minister and Minister of Presidential Affairs, were revealed at a press conference during the Abu Dhabi International Hunting and Equestrian Exhibition (ADIHEX) 2015. The rides, which will be part of the Italian Endurance Festival, comprise the FEI World Championship for Young Horses (Under 7 years) on September 26 and the HH Shaikha Fatima Bint Mubarak Ladies Endurance CEIO and the HH Shaikh Mansour Bin Zayed Al Nahyan Global Arabian Horse Flat Racing Festival Cup rides on September 27. 65 horses and riders, including 4 Juniors, started the 36th annual 400-km, 5-day Shahzada endurance marathon in St Albans, New South Wales, Australia, that began on Monday, August 24. The ultimate test of endurance horsemanship, riders must complete all 5 days and be judged fit to continue at the end to earn a coveted Shahzada buckle. Heavyweight Matthew Gadsby and Ra Silver Dancer, and Middleweight Marion Lengronne and Kalkadoon Vienna had the fastest finish time of 34:08 over the five days. First Lightweight was Curtis Kaliana and Blake's Heaven Carousel in a total time of 37.13. Isabel Foster, riding Sharabel Kalarney, was the only Junior to finish the ride and earn a buckle. 26 horses and riders completed the 5 days. Dana Al Binghadeer Al Dossary has entered the World Elite Club following her fourth place finish in Virton Endurance Championship in Belgium. Lots of people have asked me why I didn’t launch into print the day the FEI lifted its suspension of the UAE. Well, the short answer was that it was a suspension, not a ban, and was always going to happen at some point. After all, the only way the UAE can prove they can behave themselves in FEI rides is by taking part in FEI rides. The other factor was that I was so completely turned-off the subject by the cringe-worthy “welcome back” afforded to the UAE on social media from countries one rashly hoped were the decent practitioners of endurance. Most of the posters genuflecting and squealing “we’ve missed you” were youngsters who don’t maybe yet know better, or folk who make their living selling horses to the UAE. But still – yuck. Even though some memories are short, happily today we have another jolt about the utter shamelessness of senior figures in UAE endurance community and their acolytes. Thirty horses (yes, 30) have just been disqualified from February’s President’s Cup as a result of falsified qualifications. The FEI said all along it would excise the faked results from its database. It has now commenced this plus the marathon task of adjusting the results of real races where multiple participants were not qualified to start. The UAE has certainly been given enough rope to hang itself by the FEI, in the conditions set for its return to competition. Bearing in mind this most outrageous piece of fakery, out of so much other fakery, occurred in January and February this year when the UAE was already on notice from the FEI that it was in very serious trouble indeed, is it likely to have undergone a collective personality transplant in a matter of months? 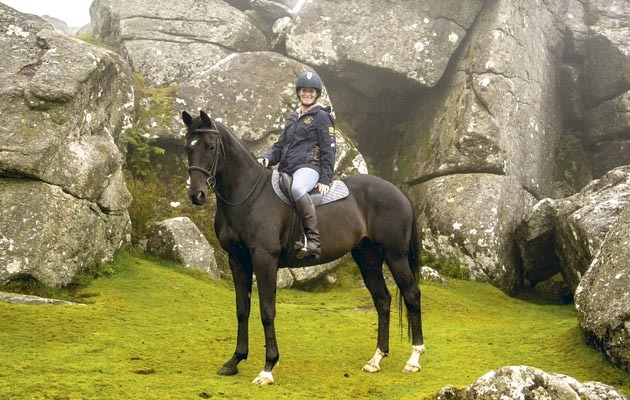 Devon eventer Mary King is “excited” about a new 100km trail ride across Dartmoor. The Dartmoor Derby, taking place next September, is inspired by the Mongol Derby, but will be less gruelling. It will take in open moorland, gorse, forests and ancient stone circles. Riders can take their own horses or ride borrowed mounts on the three- to five-day ride. “We’ve had guests from all over the world riding with us and the feedback we’ve had is that Dartmoor is fantastic,” Elaine Prior of organisers Liberty Trails told H&H. While the ride is long-distance — participants will cover at least 100km in total — it is not a race and combinations do not need endurance experience. NEW RINGGOLD — The bond between a local girl and her horse led a team to victory Aug. 21 at the Federation Equestre Internationale North American Endurance Team Challenge in Ontario, Canada. “It was an absolute honor to qualify. I wasn’t expecting it. The athletic power of my horse is just incredible,” Emily Stemmler, 21, of New Ringgold, said Tuesday. The 75-mile race through the Ganaraska Canadian Forest involved riding four phases of color-coded trails through various terrain with gaits varying from walk, trot and cantor to gallop. Stemmler rode Faveur, a 9-year-old Asgard Arabian gelding, through the finish line in seventh place, combined with the scores of her two teammates, Meg Sleeper, Virginia, who placed first, and Katherine Gardener, Rhode Island, who finished eighth. The race began at 6:30 a.m. and all had to complete the race before 7:30 p.m. to avoid team disqualification. Seven riders represented the northeastern region of the country in the race, but participants came from as far as California, Ireland, Israel and Romania. Each phase of the race was separated by mandatory holds, or rest periods. “It’s just something that the horse has to do on their own. Faveur did amazing with it,” Stemmler said. A crew was assigned to each rider to get the horses heart rate below 64 beats per minute as quickly as possible. Horses were checked by an official veterinarian before the horse and rider could continue. Stemmler has completed a couple 50-mile rides and three 75-mile rides before, so she and Faveur were prepared. Horses and riders needed to complete five rides through American Endurance Ride Conference, National Federation for Endurance, then complete a 50-mile FEI ride to be eligible to ride at the 75-mile FEI level at NAETC. FEI is an elite branch of endurance that is internationally recognized and has its own specific regulations and registrations for both horse and rider. The scariest part of the race was at the starting gate for Stemmler. “The starting gate is where it’s most nerve wracking. Forty-two horses go out at a trot and sometimes a gallop,” Stemmler said. Hills proved most difficult for the horses, but Faveur was used to them. Stemmler has been riding Faveur for three years. “I love this horse. I absolutely love him, he is incredible,” Stemmler said. “I’ve done all but two endurance rides on him. He’s a very independent horse. Faveur is not an affectionate horse when first confronted, Stemmler said. “It definitely took time to build up, but after you go that many miles it kind of just develops,” she said. Faveur, owned by Holly Corcoran, was bred for endurance races. “He was already trained before I started riding him. From birth, he was bread for endurance and given the best possible advantage,” Stemmler said. Changes are under way to the FEI database as the fallout from the so-called phantom endurance races in the United Arab Emirates (UAE) continues. The UAE national federation was provisionally suspended last March following an investigation by the FEI into what it called major horse welfare issues and non-compliance with the rules in endurance. Around the same time, evidence emerged of UAE endurance races for which blocks of results in the FEI database appeared to mirror those of earlier races. This issue was unrelated to the suspension. 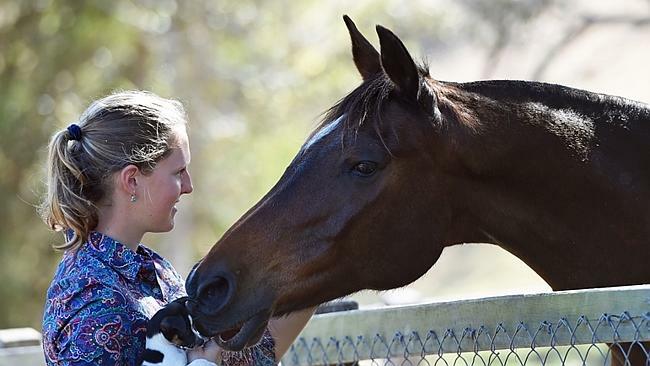 THERE’S never been any doubt that Alexandra Toft, 20, would take up endurance riding. 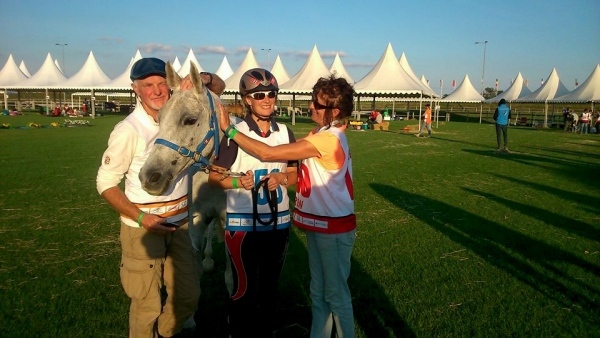 Her parents, Penny and Peter, run a successful endurance horse stable at Marburg in Queensland and compete internationally. Toft has been riding since she was two and completed her first endurance event at seven. She is just back in Australia after competing at San Rosorre, Pisa, Italy, in a 120km FEI two star young riders event. She finished in a very creditable sixth place on the Toft’s home-bred mare, Dream Dancer TE. There were 17 riders from Italy and Europe, five riders from the Middle East including the United Arab Emirates and Bahrain, with one Australian in a field of 24 horses. The race was won by a United Arab Emirates entrant at 22km per hour. The first four places went to the Emirates, fifth to France and sixth to Toft. Toft has represented Australia on four occasions at two World Youth Endurance Championships, receiving a team bronze medal in Abu Dhabi in 2011. She also competed at the World Equestrian Games endurance test event in Sartilly, France, in 2013. Her mount in the San Rosorre ride, Dream Dancer TE, has been stabled in France for three years and is trained by Jean Michel Grimal. It was the first competitive race for the 11-year-old mare, who finished strongly at an average of 20.3km per hour. “Dream Dancer TE was fresh at the end in a gallop finishing with the first of many local Italian riders,” Toft said. “I was very excited with the ride and proud of my horse — she pulled up amazingly. “It was a great experience riding among the world’s best. Other events contested over the weekend included an FEI two-star 120km event and an FEI three-star 160km event. Thirty horses, the majority trained in 13 stables owned by the ruling Maktoum and Nayhan families, have been disqualified from the UAE’s most onerous endurance race, the 160km President’s Cup, as the clean-up of the “phantom” rides begins. The FEI has commenced the marathon task of deleting 15 faked rides from its database, and adjusting results of real races whose participants were not qualified to start. The 30 horses represent 20% of the President’s Cup starters. They include the runner-up, Kalifa, ridden by Suhail Al Ghailani. Hadeer, the ride of world champion Sheikh Hamdan, was not qualified for this or his previous two races with other riders.